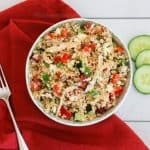 This Greek Quinoa Chicken Salad is a delicious and easy recipe that’s perfect for a summer lunch or dinner. With rotisserie chicken, quinoa, feta cheese, bell peppers, cucumber, and a lemon vinaigrette, this dish comes together in no time and is just as good cold as it is served warm. Tomorrow the Mr. and I are headed out to see our son, Cameron who is currently hiking the PCT – Pacific Crest Trail. He began on March 19th and is now in S. Lake Tahoe at mile 1093. He’s only got 1,557 to go until he finishes up in Canada! We couldn’t be more proud of him. It’s amazing what he’s done so far and the way it’s changed him. Seriously, if you want your kids to grow up and become more independent have them hike the PCT! Wait, that sounds as if his dad and I forced him to do it, but that’s quite on the contrary! This was an undertaking he decided to do all on his own. It certainly isn’t for everyone, but it is definitely life changing even for mom and dad. You can read more about his adventure and what it’s been like from my perspective here. Let’s just put it this way, I cannot WAIT to hug that kid tomorrow! 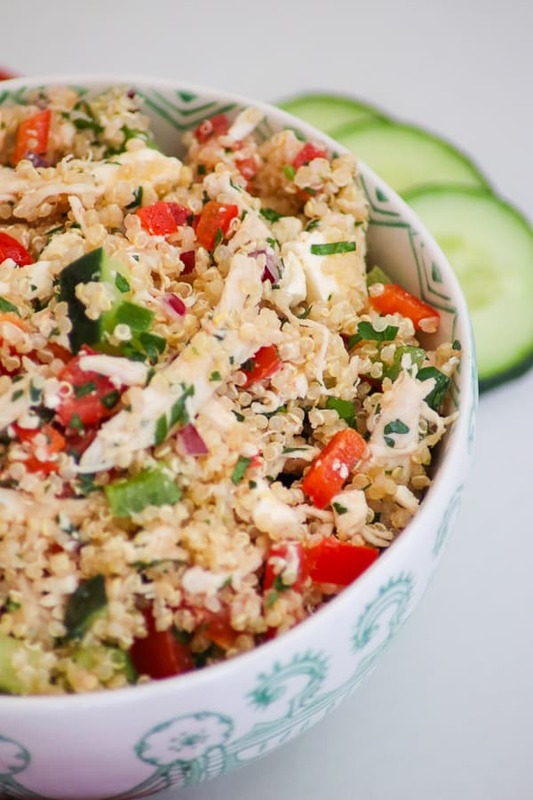 Save this Greek Quinoa Chicken Salad to your favorite PINTEREST BOARD! Do you love using rotisserie chickens to make your meals as much as I do? Not only are they delicious, but it just makes it so much easier to put a delicious homemade meal together quickly and with little effort. I used one for this Cheesy Chicken, Broccoli and Rice Casserole. You can also use it in one of my most favorite dinner recipes, this Couscous Chicken Salad. This is one salad that is seriously out of this world. I’ve made it so many times and everyone who tries it absolutely loves it. I’m sure you will, too! If you prefer not to use a rotisserie chicken in either of these recipes, then you can definitely cook the chicken any way you prefer and use that. 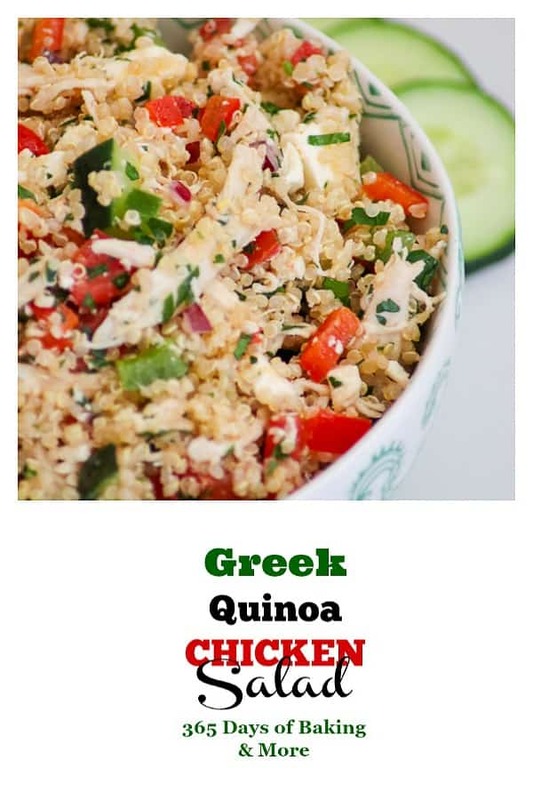 This Greek Quinoa Chicken Salad is a delicious recipe and perfect for summer. It’s already been in the triple digits here in Phoenix, so anyway I can make a meal without having to turn on the oven is a huge plus! I certainly don’t want to make it hotter around here than it already is that’s for sure! ANd the great thing about this dish besides the fact that it’s easy, delicious and will save you money from eating out is that it tastes just as good if not better the next day. We like to eat it right after I mix everything with the warm quinoa. BUT if there are any leftovers (which there might not be!) and the flavors have had a chance to combine, it will be a great way to enjoy it as well. I’m not an olive lover, so I know some people will tell me that this really can’t be classified as anything Greek since it doesn’t include them. BUT if you love them, add some kalamata olives or whichever you’d prefer! Slices of or diced avocado will add some more great flavor and will make this dinner even healthier. The use of the bell peppers, as well as the cucumber, gives it a fresh taste. Kudos to you if you can use some of those tasty veggies n this recipe that you’ll be growing in your garden this summer! This recipe is slightly adapted from these Greek Quinoa Bowls I found at Peas and Crayons. I love cooking with quinoa. It’s a great and healthy grain. We really enjoy eating these Quinoa, Black Bean, and Turkey Stuffed Peppers. The combination of quinoa and black beans makes it a hearty meal. You can substitute ground beef if you’d like, but the turkey is a healthier option. I also used quinoa here in this unexpected baked good. Not only is it tasty, but it’s a great accompaniment to your morning cup of coffee or afternoon tea! This Greek Quinoa Chicken Salad is a delicious and easy recipe that's perfect for a summer lunch or dinner. 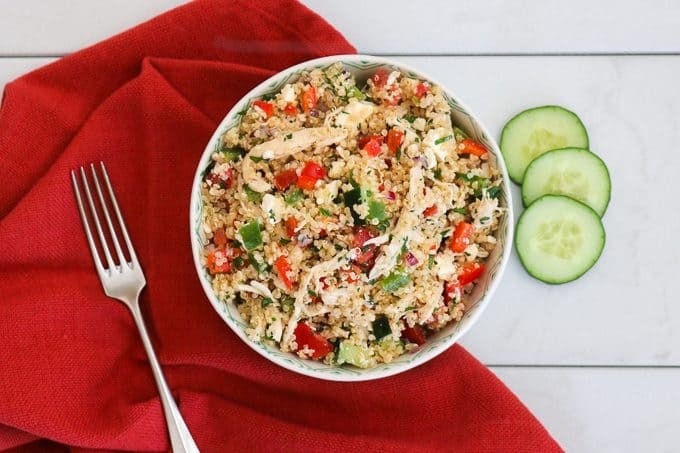 With rotisserie chicken, quinoa, feta cheese, bell peppers, cucumber and a lemon vinaigrette, this dish comes together in no time and is just as good cold as it is served warm. In a liquid measuring cup, combine the olive oil, lemon juice, apple cider vinegar, oregano, salt, and pepper. Mix with a whisk. In a medium saucepan, boil the water. Rinse the cup of quinoa in a fine mesh sieve under cold water until the water runs clear. Drain well. Add to boiling water. Reduce heat to simmer and cover. Cook until the germs have spiraled out of each grain, about 15 minutes. In a large bowl, combine the chicken, chopped peppers, cucumber, onion, feta, and parsley. Mix well. Add the cooked quinoa to the bowl and toss gently. Mix dressing well again and pour over salad. Salads are a great option for meals on a hot summer’s day. I mean, when it’s that hot outside and if it’s muggy where you are you certainly don’t want to be slaving over the stove. This Summer Italian Spaghetti Salad Recipe has such delicious flavor and will come together for you in no time! Pair it with a loaf of fresh garlic bread and a nice glass of wine and you’re ready to entertain your guests! Fire up the grill and make this Grilled Chicken Summer Salad with Mango. I love the combination of flavors and fruit is always so delicious when paired with meat. I love sauteeing summer squash and zucchini with some butter and onions. This Raw Summer Squash with Arugula, Feta, and Herbs has me looking forward to eating the squash a different way. You can hardly notice the shredded chicken pieces in the dish.i love it.